If you are holidaying near Riberac don't miss a visit to Aubeterre-sur-Drone. It is one of the 'most beautiful villages of France' and it has an amazing underground church hewn out from the rock. The village is in the South of the Charente region at the northern limit of the Perigord area. The village has been built up the hillside above the river Dronne in a curve of the river - giving the village the feeling of being a large amphitheatre. 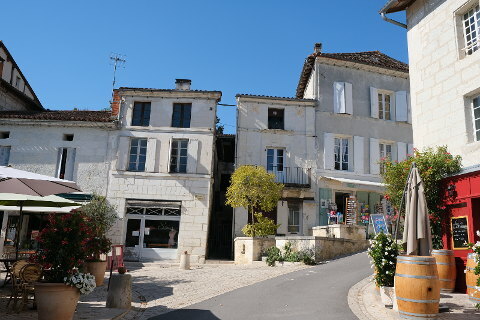 The houses in Aubeterre-sur- Dronne are built in the lovely white stone of the region and which has given the town its name which means white earth. Many of the houses have charming wooden balustrades, quite typical of houses in this area and lovely to see in the summer when they are usually decked with flowers. At the centre of the village is a lovely square filled with shops, artists workshops and bars and restaurants where you can sit out on a sunny day and savour the atmosphere of the village. 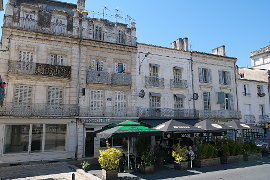 The square, 'Place Trarieux' is named after Ludovic Trarieux, founder of the French League of Human Rights, who was born in the village. There is a car park near the top of the village and from here it is a short walk upwards to admire the views and buildings at the top. 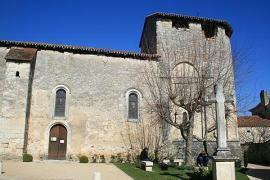 The Clarisses convent and the Cordeliers and Minimes monasteries are situated in this high part of the village. In the summer you can take a guided visit of these. In the lower part of the village the Underground Church of St Jean, also known as the Monolithic church, Eglise Monolithique, or the troglodyte church is outstanding. The church has been carved out of the rock and inside is enormous. The height reaches to 20 meters at its highest - taller than that of St Emillion. Indeed the Monolithic church of Aubeterre sur Dronne is the tallest in the world. (St Emillion's, though not as tall, is the largest in Europe). The church was hidden for years by a large rock fall and only rediscovered in the 1950s. Excavations began in the fifth century when a total-immersion baptismal font was carved into the floor. To the left of the font there is a large area where 80 burial hollows have been carved into the stone, each with its head pointing to Jerusalem. To the right of the font there is a large stone reliquary which is said to have housed an important holy relic, but the relic has now disappeared. A stone staircase leads up to the first floor from where you can get some tremendous views of the interior of the church. A passageway once went from here to the chateau which lies up above the church. At the entrance to the church there is another section with more tombs. These were laid out to face the reliquary rather than Jerusalem. In Aubeterre-sur-Dronne there is also a Romanesque church, the church of St Jacques which was also built to welcome pilgrims on route for Santiago de Compostela. This has a wonderful 12th century Romanesque facade with finely carved arches and some great ghoulish carvings on the capitals. The facade has a strong Moorish influence. As well as being a "most beautiful village" of France, Aubeterre-sur-Dronne is also listed as a «Petites Cités de Caractère» or small town of character since 2012. 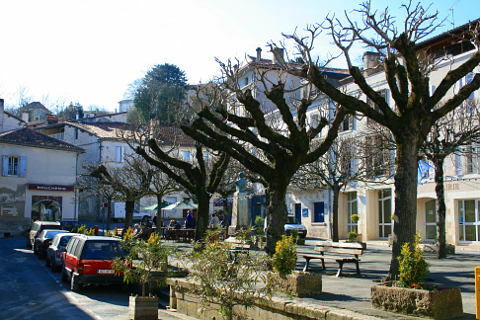 Riberac is a popular market town and a useful centre when visiting the northern part of the Dordogne area. 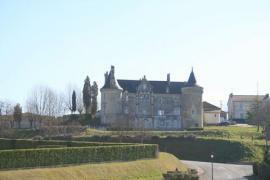 Saint Aulaye with its Renassaince chateau and 11th century church is also a pleasant village.